Liens are instruments, recorded with the land records for the locality where the relevant real property is situated, that document the agreement between the owner/customer and the contractor. They generally include a description of the work requested, a tentative schedule, and an information about charges and payments. For example, let's say a customer pays the total balance due. The contractor then releases the rights reserved by a recorded lien. Unconditional waivers do not require bank confirmation, so the claimant completes and records an unconditional waiver on final payment form, which identifies the parties, the nature of improvement, the property, and the relevant dates and payments applied. This article is provided for informational purposes only and should not be relied upon as a substitute for the advice of an attorney. 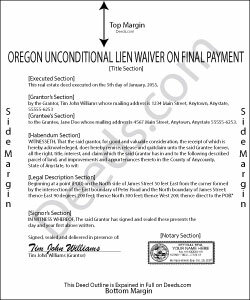 Contact an Oregon lawyer with any questions about waivers or other issues related to construction liens. ralph f. said: I VERY MUCH APPRECIATE THE PROMPT RESPONSE & HELPFULNESS. I WILL DEFINITELY USE THIS SERVICE IN THE FUTURE. THANK YOU! Reply from Staff: Thank you Ralph, we appreciate your feedback. Linda S. said: I am quite pleased with this website. I was able to complete my task with relative ease thanks to all the help these forms provided .The example forms really helped me to navigate the process. I would recommend this service highly. Reply from Staff: Thank you Linda, we really appreciate your feedback. Kim M. said: Purchased the Warranty Deed package for $19.95 which included all the forms I needed including instructions and a sample form. Seamless transaction filing with our local county clerk's office - she even commented it was one of the best prepared packages she has seen. Thanks for saving me a ton of money! Reply from Staff: Thank you Kim, we appreciate your feedback. david t. said: No review provided.